When I first thought of teaching an intensive summer seminar on New York’s downtown scenes — which I just wrapped up last Friday — I planned only to teach the 1970s. Gearing up to write my 33 1/3 volume on Television’s Marquee Moon, I wanted to immerse myself in a broad range of materials from the period detailing a number of overlapping downtown arts scenes. I quickly realized, though, that much of what I wanted to do with the 70s in class required some understanding of the area’s arts scenes in the 1960s, and so I decided to expand the timeframe to 1960-80. When the final reading list was drawn up, I’d reached back even further: I had a hunch that the work of some particular downtown arts pioneers who created seminal works in the 1950s — Allen Ginsberg and John Cage, especially — would become threads that would weave through the entire course. Turns out I was right in both cases, but especially in Ginsberg’s. (Other people whose work proved to have lasting effects on the downtown scenes we discussed include O’Hara and Warhol.) Almost without fail, Ginsberg turned up in every day’s discussion over the course of our two weeks, either as a direct influence, a character, a mentor, or a commentator. His appearances ranged from the goofy parka-wearing, pot-smoking version of himself in Pull My Daisy to the author of Howl (which in turn authorized The Fugs’ memorable “I Saw the Best Minds of My Generation Rock”) to the prophet wandering in the background of Dylan’s “Subterranean Homesick Blues” in Pennebaker’s Dont Look Back. Jonas Mekas captured him plotting with Barbara Rudin and other LES lefties in the 1960s (we watched the second reel of Walden) and as a fixture on the LES poetry scene he popped up in several of the pieces we read by our friend Daniel Kane. 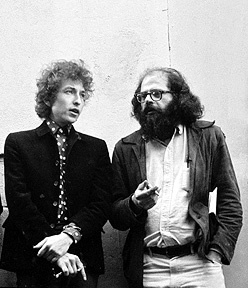 Ginsberg offered astute commentary on Dylan’s lyrics in a PBS documentary on the history of rock and roll. He provided a very memorable scene in Jim Carroll’s memoir Forced Entries, worked with — and claimed to deflower — the downtown composer and scene-crosser Arthur Russell, and befriended Patti Smith. He lived in the same building as both Russell and the members of Television. (Richard Hell still lives there.) In Steven Sebring’s Patti Smith: Dream of Life, which was the very last thing, along with Smith’s Just Kids, that we considered for this course, we see Patti’s very emotional reading at a Ginsberg memorial; later in the film she chants the “Footnote to Howl,” offering all the evidence anyone should need that even Ginsberg’s most idiosyncratic work holds up under someone else’s voice. I’m still trying to work out exactly what it was that made Ginsberg’s legacy so unique in the materials we discussed. Although I opted not to show it to the class, I privately viewed a late-1980s odd-ball documentary on East Side poetry, Maria Beatty’s Gang of Souls: A Generation of Beat Poets, in which nearly every poet interviewed, including younger writers and musicians such as Richard Hell, Lydia Lunch, and Jim Carroll, singles out Ginsberg as the towering figure of twentieth-century New York writing. Cage’s influence on musicians and artists, by contrast, was subtle, almost imperceptible, though still very much in place. Perhaps Ginsberg seemed to matter because he offered such a clear model for how to make a scene and how to canonize one’s comrades. But he also seemed to matter because he was, quite simply, on the scene for so long, taking an interest in younger writers’ work (and more), offering advice, continuing to read in public. O’Hara mattered as an icon in his early death (and a pioneer of a poetics that clearly took hold among other New York School poets); O’Hara also drew young, aspiring poets to the city, but that hands-on influence was cut short. Warhol mattered as a media mastermind and behind-the-scenes manipulator. But Ginsberg just seemed to be there wherever we turned, presiding, prodding, provoking. In the history of late-twentieth-century New York writing it’s difficult, I’m finding, to come up with someone whose life and work had broader impact. Ginsburg just hung out. It was the coolest thing and he was always right there, in your scene without asserting any dominance over it. This was the late 70’s, in the punk-to-new wave change over. Allen would show up at our place on the upper west side, visiting a newphew, hang out while we rehearsed, watch us get stoned, smile, walk down Amsterdam with us, laugh about things, then slip away. He was watchful, unobtrusive and celebratory. Our lives weren’t good or bad as statements. They were just our lives. We really appreciated him for that. Thanks, DRM — I’ve really appreciated your comments here over time. This was a fun one.